Managing a career is no longer a linear process. The rules have changed and so have the opportunities that are available to you. The overall numbers haven't changed. There are just as many jobs as there used to be, they're just different. What does that mean for you and for your career? It could be the difference between achieving real measurable success and just getting by. Staying on track. It’s easy for smart people to get derailed. Make sure that you remain mindful of the need to anticipate and respond to change. Maximizing the time and resources you invest in managing your career. Transition is inevitable and will happen at many points as your career unfolds. It can be voluntary: You’re driving the decision to make a change. Maybe you’re feeling frustrated or unfulfilled, or you recognize that you’re on the wrong track. Alternatively, and more likely in the current economy, the decision is involuntary. It’s made for you. You’re terminated, fired, made redundant, “RIF-ed”. Whatever the language, the decision is not yours. They’ve taken that power away from you. Or there’s a third scenario, some combination of the two: You see the writing on the wall and it’s telling you to take immediate action. Figuring out the next step either along the same path or a new one. Explaining the separation, positioning the events in the most powerful way possible, and minimizing any and all potential fall-out. Preparing the right resume and developing an approach to correspondence that is simple yet effective. The right message and tone will inform your search and determine the direction it takes. They will also get people to pay attention to you. Interviewing techniques that distinguish you and make you exciting for all the right reasons. Negotiation strategies that generally work. Notice the language here: No guarantees. This is not magic, it’s about strategy. That’s why working with a coach who’s been involved in complex negotiation discussions is critical. There’s no way to ensure that you’ll get everything you want but at least you’ll be in good hands. What is executive coaching? There are far too many definitions and approaches and as many firms and practitioners who deliver the service. Whether you’re an individual seeking it out on your own or an organization undertaking the program on behalf of an employee, its goal is to provide career support and insight on the job and to address specific behavioral and organizational challenges. Although executive coaching is sometimes remedial in nature, it is best used as a tool to promote career success and leadership. Executive coaching is objective, practical advice and strategy to help you navigate your life on the job. It's simple in concept, yes, but often more difficult to execute. A program can be highly structured with various stages for information gathering and feedback, evaluation, discussion, and measurement of your progress. Alternatively, it may be as basic as on-going regular meetings to keep you on track, focused, and aware of both landmines as well as opportunities. You decide what’s best for you, the organization, and your budget. Sometimes just having a safe and confidential place to vent is enough. 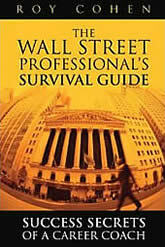 "Roy Cohen is America’s top Wall Street career coach. This timely book will save and redirect many a career. Roy will show you how to do it, whether you are entry level or a top executive. No one in America has Roy Cohen’s experience and insight in helping Wall Streeters with their careers. He knows the language and the solutions to their career-related problems." © 2010 careercoachny.com. All rights reserved.